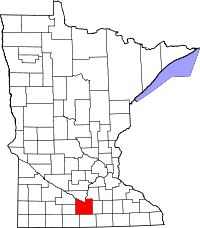 Blue Earth County, named for the Blue Earth River which runs through it, offers certified copies of birth and death certificates dated from 1870 to the present, as well as certified copies of marriage licenses dated from 1865 to the present through the Vital Statistics Department, which, in turn, is connected with the Licenses and Certificates Department. Copies of birth and death records can be requested either in person at the Vital Statistics Department in the Blue Earth County Government Center in Mankato, MN, or by mail. In either case, the appropriate application must be filled out, and to obtain certified copies of records, individuals must show they have a tangible interest in the record, which is to say, that they are legally related somehow to the registrar. Uncertified copies, however, are available to the public with no restrictions, and only require the correct application and fee.